Nineteen people have been killed in a suspected terrorist attack during a pop concert by US star Ariana Grande in the northwest English city of Manchester, police said Tuesday. 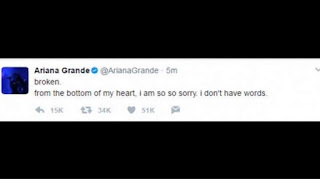 There were scenes of panic as Grande's audience of youthful fans fled the 21,000-capacity venue after what eyewitnesses described as a "huge bomb-like bang" in the foyer area at the end of the concert. 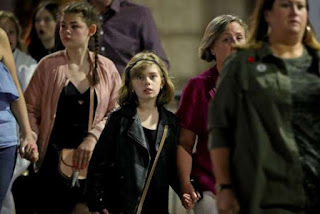 A fleet of ambulances was seen rushing to the venue and bomb disposal teams were dispatched soon after, as city residents opened up their doors to stranded concert-goers after train services were shut down. "So far 19 people have been confirmed dead, with around 50 others injured. This is currently being treated as a terrorist incident until police know otherwise," police said in a statement. "All our thoughts are with the victims and the families of those who have been affected," she said in a statement. The first unconfirmed reports of an explosion emerged shortly after 2145 GMT on Monday. Gary Walker from Leeds told BBC Radio 5 Live he was hit by shrapnel in his foot and his wife sustained a stomach wound as they waited for their daughters to come out of the concert. "We heard the last song go and then suddenly there was a massive flash and then a bang and smoke," he said. 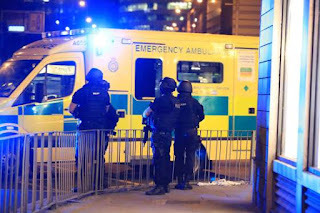 Manchester Arena said the incident "took place outside the venue in a public space". Isabel Hodgins, an actress who had been attending the concert, told Sky News: "Everybody was panicking, there was pushing up the stairs. "The corridor was full, it smelled of burning, there was quite a lot of smoke as we were leaving. "It's just shocking and we just feel very shaken up. We're just lucky to have gotten away safely," she said. Majid Khan, 22, who was attending the concert with his sister, said: "A huge bomb-like bang went off that hugely panicked everyone and we were all trying to flee the arena". Calvin Welsford, 18, from Bristol told the BBC: "It almost sounded like a gunshot". "I looked around and people were just spilling down, heading out of the building". "I was actually having an asthma attack. It was sheer panic," he said. Police carried out a controlled explosion in a small park near the venue a few hours after the blast but said the item turned out to be only abandoned clothes. Manchester residents opened up their homes to people who could not get home after the incident, sending messages with the hashtag #RoomforManchester. Robert Tempkin, 22, from Middlesbrough, told the BBC: "Everyone was screaming and running, there were coats and people's phones on the floor. People just dropped everything. "Some people were screaming they'd seen blood but other people were saying it was balloons busting or a speaker had been popped. "There were lots of ambulances. I saw somebody being treated. I couldn't tell what had happened to him." The Manchester ambulance service warned people only to call "for life threatening emergencies" as it had "a large number of resources at the incident". Suzy Mitchell, whose flat is opposite the venue said she heard "a huge bang" and came out of her flat to see "everyone was running away in big crowds". Train services to and from Manchester Victoria Station -- located under the Arena -- had been cancelled. "Disruption is expected to continue until the end of the day," National Rail said in a statement. British Transport Police said in a statement: "Officers are at Manchester Arena following reports of an explosion within the foyer area of the stadium at 10.30pm this evening.